This blog has lead me to people that I wouldn't necessarily have crossed paths with otherwise. I have gotten to connect with so many incredible people on and off line. Living here in Juarez, and being so close to the US Consulate, we come across a lot of people who can relate to our situation, especially those who have to come here for their visa appointments or the likes. I have frequented immigration and expat forums online over the years but recently, this blog has allowed me to meet a lot of these people face-to-face. This week I met the attorney and staff of the Izaguirre Law Firm. They seemed enthusiastic albeit apprehensive to head into Juarez. They came to the area from Colorado because one of their clients recently filed an asylum case based off of domestic violence charges on both sides of the border. The woman is currently being held at a detention center in El Paso and her attorney, Stephanie Izaguirre, came to El Paso on her behalf. Stephanie has been reading this blog and wanted to meet my husband and I. It was an awesome experience. I was able to meet her staff as well and hearing their stories were inspiring. Her paralegals are actually both Mexican by birth and one of them hadn't been back to Mexico since she was 7 years old. She seemed quite frightened as we parked their car at a lot in downtown El Paso and got into my car to head across the border. Yet, at the same time, I sensed a bit of optimism under all of that fear. Although most people passing through El Paso don't dare to cross the border, Stephanie really wanted to have dinner in Juarez and get a taste of the city and the lives we live. When we approached the Santa Fe Bridge, her paralegal blurted out that she couldn't feel her legs. She was scared shitless. I don't blame her. If you haven't been back to Mexico in a couple decades, Juarez isn't exactly at the top of your list of vacation destinations. I understood the fear. When you follow the US press and you hear what you hear about Juarez, it can be quite frightening. Luckily nothing out of the ordinary took place. Whenever I am playing tour guide and showing my beloved Juaritos to people from out of town, all I can do is cross my fingers and hope nothing horrible happens to scare them off. So far I've been lucky. The worst thing that's happened was getting pulled over by Transito within 5 minutes of a fellow blogger from Reynosa getting into my car. That ended with getting my driver's license taken away but I just ordered a duplicate license, which cost me a fraction of the price of the ticket in Mexico. That's 15 dollars I'll never see again. We ended up having a really nice dinner. They'd had a bad experience eating sushi in El Paso the night before and had a hankering for some good seafood, a tall order to fill in Juarez, which is a 10 hour drive from the nearest ocean. 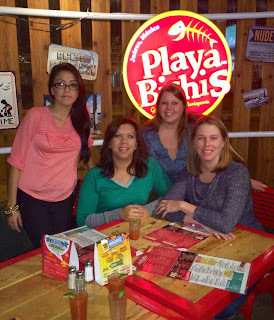 We ended up at Playa Bichis which isn't as popular as Villa del Mar but equally delicious. Or so I hear. I am allergic to shellfish and tend to stay away from seafood entirely. While everyone devoured their shrimp, I dug into my tacos de alambre y tocino con salsa chimichurri y aguacate. It was really fun and interesting to meet these woman and learn more about their lives in Colorado and a bit more about the ins and outs of being an immigration attorney. We commiserated over the poor immigration advice that is passed out in the media like Halloween candy and discussed our hopes for reform and a positive outcome on their recent case. 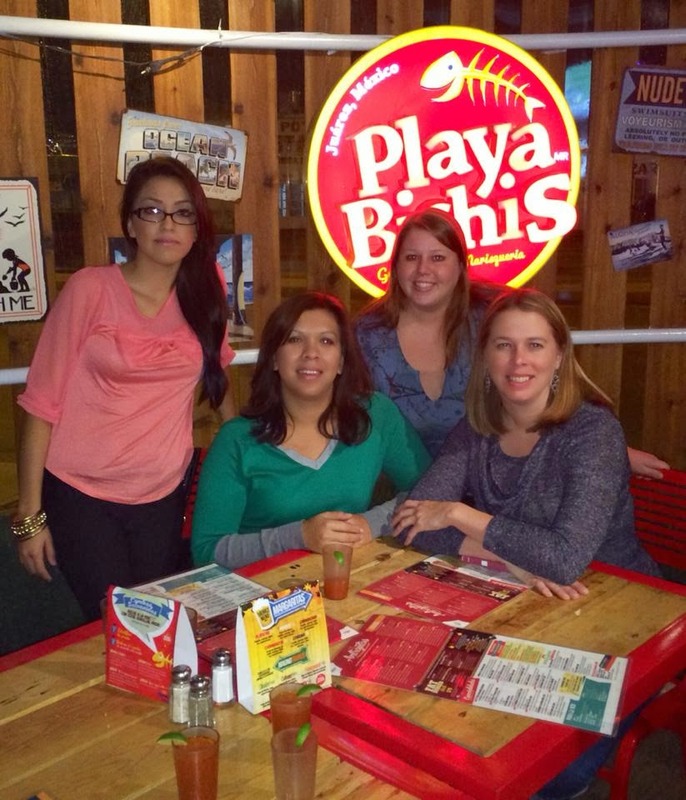 Myself and the gals from the Izaguirre Law Firm, just before dinner. I was also able to meet a fellow member of American Families United this week. She came from Queens to Juarez for the last of her husband's Visa appointments. That was awesome because most of the AFU members I associate with are people who are affected by long-term-to-life immigration bars and aren't eligible to apply for permanent residency so it's rare that I meet members outside of the Las Cruces/El Paso/Juarez area. I've met more Immigrate2US members than AFU members over the years so this was quite a treat. Meeting these women was refreshing and I am just super thankful that this blog and all of the forums and groups I participate in have allowed me to meet so many amazing individuals. Getting a chance to see people from all over the US who are going through similar experiences is such a privilege. Emily, what a lovely group of ladies. But what really caught my eye was the sign just to the upper right (your left) of the round Playa Bichis sign. Looks like an exciting place to eat! They do have the best signage. My favorite is one that shows you how to order a beer in like 50 different languages. We had good news...our client was released and her case will almost certainly be granted. Sadly that means we won't be back in El Paso this week but if we get more clients down there we will have to have dinner again. It was a pleasure to meet you. Fantastic news about your client! It's a shame she had to spend months in detention to get to this point though. I just wanted to say that I have been reading your blog since I heard your story on This American Life and I really enjoy it. Thank you for taking the time to share your life with us.